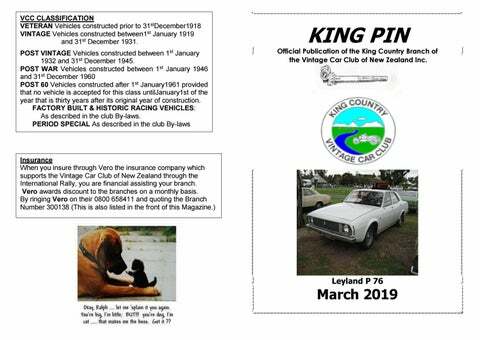 Official Publication of the King Country Branch of the Vintage Car Club of New Zealand Inc.
Secretary Snippet’s Well, what a terrible few days we are having, with all the problems in Christchurch. This time I have prepared an article on the Leyland vehicles. Recently I sent you out information on the visit of Leyland group to Taumarunui and Ohura for the weekend. So there is a Meeting at 1p.m. Norma Hi, I have been talking to Wayne and there is a slight change to what he organised this month. The museum we were going to visit isn't available on that day, so I have arranged to visit a private garden at Ngakonui. We would like the meeting to be at 1.00 and then head to Ngakonui for a look around and afternoon tea of homemade Danish baking. I have said we will provide Tea, Coffee, Sugar and milk. Can you please put this in the bulletin please. Thanks Ivan. 1929 Dodge DA Five Window Coupe. By kind permission Johnston Collections. The rally route this year will take all around the big hill in the middle of the province. Leyland P76 P76 today The P76 continues to have a loyal following of owners who have great enthusiasm for the car. There are at least seven P76 owners clubs in Australia and New Zealand. The New Zealand P76 Owners' Club was founded in 1983. After production of the P76 ceased, Leyland Australia limited its local production to the Mini and Mini Moke, both produced at Enfield, along with commercial vehicles and buses.The Leyland P76 is a large car that was produced by Leyland Australia, the Australian subsidiary of British Leyland. Featuring what was described at the time as the "standard Australian wheelbase of 111 inches", it was intended to provide the company with a genuine rival to large local models like the Ford Falcon, the Holden Kingswood, and the Chrysler Valiant. But, due to the first real fuel crisis and demand far exceeding the supply, Leyland rushed the assembly process with the first of the P76s to come off the assembly line, resulting in poor build quality and some reliability problems. The combination of the rushed assembly, fuel crisis and strikes at the component manufacturers' factories, resulted in the Leyland P76 being labelled a lemon, despite receiving the Wheels magazine Car of the Year in 1973. By 1974, sales of the P76 had slumped and BMC decided to end the production of the P76. Although the P76 has been labelled a lemon in Australian motoring history, it has become an iconic Aussie car and has a loyal following. In 1969, Leyland Australia was given the goahead to build a large car for Australia. At the time of the car's launch, it was reported that Leyland Australia had an accumulated deficit equivalent to £8.6 million, and had borrowed the same amount. In 1969, Leyland Australia was given the go-ahead to build a large car for Australia. version of the 1622 cc B-series engine; the Wolseley was a 6cylinder version of the Wolseley 16/60); and the 1971 Austin "X6" Tasman and Kimberley(facelifted Austin 1800s with the 6-cylinder 2.2-litre E-series engine). Each of these cars was a compromise, and the motoring public largely rejected as challengers to the dominant local models. Nonetheless, the Freeway, 24/80 and the X6 each developed a loyal following. receiving the Wheels magazine Car of the Year in 1973. By 1974, sales of the P76 had slumped and BMC decided to end the production of the P76. Although the P76 has been labelled a lemon in Australian motoring history, it has become an iconic Aussie car and has a loyal following. therefore seen as crucial to the survival of Leyland in Australia. Launched in 1973, the P76 was nicknamed "the wedge", on account of its shape, with a large boot, able to easily hold a 44 gallon drum. Although station wagon and "Force 7" coupé versions were designed, these never went into mass production. The base model P76 Deluxe was differentiated from the higher specification models by the use of two rather than four headlights Design and engineering. The shape was penned by Giovanni Michelotti. The entry-level P76 featured an enlarged 2623 cc version of the 6-cylinder engine from the smaller Austin Kimberley and Austin Tasman. The top-of-the-line aluminium alloy 4416 cc V8 unit was unique to the P76, and was a derivative of the ex-Buick V8 that was powering the Rover 3500. Leyland Australia cited a weight advantage approaching 500 lb (230 kg) for the P76, most of which was attributed to the lighter weight of the aluminium engine block when compared to the cast iron blocks (with bigger displacements) of the V8s from Chrysler, Holden and Ford. It was hoped that the weight advantage would feed through into superior fuel economy and extended tyre life. 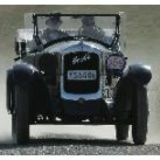 Nevertheless, the car was a full-size car in Australian terms, for which class leading boot/trunk capacity.